Screen printed roller shades will make a splash in any room! Shades are often an overlooked area to decorate the home or business with your personal style. Add extra color, unique design, and excitement to your window coverings with one of the latest window treatment trends for 2014. When designing your interior or refreshing a room, screen printed roller shades with a Disney character or logo of your favorite MLB, NCAA, or NFL team let you easily have your favorite teams printed right on to your shade. Increase your fan dedication points in the man cave or show your bar/restaurant’s support by putting your team’s logo in your front window. Think of the smile on your daughter’s face when you pull down the shades on her 8th birthday to reveal her favorite Disney Princess right there on the screen printer roller shades! Every die hard fan needs to represent their team, but wearing a sports jersey just doesn’t cut it anymore. Adding your favorite team’s logo to your roller shade shows you are more than the average fan and represents commitment to the sports team of your choice. 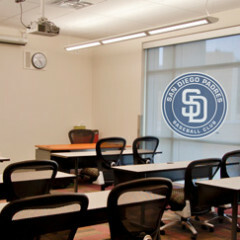 If you are a San Diego Chargers or Padres fan, the next addition to your business or home’s window coverings should be a screen printed roller shade with your team’s logo. Choose from any team in any league in the MLB or NFL. Whether a Prince or Princess, surprise your children with their favorite character right on the inside of their roller shade! You know they will love having this large print in their bedroom or playroom, but which Disney character will you choose? The particular shade referenced in the video is a Little Mermaid Disney print that is recommended for a children’s bedroom. Choose Aladdin, Belle, Nemo and any other Disney licensed prince/princess character including Star Wars in the near future for you screen printer roller shades. The hardest part will be finding the right character for your home. 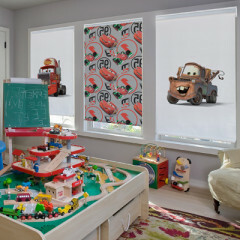 Roller shades do not have cords and therefore are more child and pet safe than traditional shades. Replacing your current window treatments with a child safe option is another great reason to upgrade. Interested in more information on child safety? Download our guide on child safe window treatments to learn more. Disney, NFL & MLB designs are the latest in screen printed roller shades, contact us for all your options! Not sure which screen printed roller shade is right for you? Speak with one of our knowledgeable consultants at 3 Blind Mice Window Coverings to choose the best option.